Keswick Adventure Centre is the premier outdoor provider in the area, offering adventure activities and things to do in Keswick, the Adventure Capital of the Lake District, Cumbria. We cater for ages from 7 years to 70 - subject to height restrictions and weather conditions. We offer (in order of adrenaline rush! 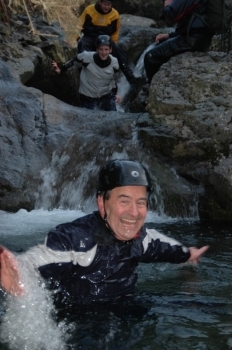 ): Ghyll Scrambling (a wet descent of a mountain river), Via Ferrata (attached to a steel cable 1200' above the floor! ), Abseiling, Rock Climbing, Stand Up Paddleboarding, Canadian Canoeing, Raft Building, Mountain Biking and Mountain Walking. All activities are classed as 'Half Day' activities, hence two can be done in a day. All sessions must be booked in advance to avoid disappointment, and sessions start at either 10am or 2pm (winter start times are 10am and 1:30pm). Prices start at £25pp with discounts being offered for groups of more than 10 people. School groups, Stag and Hen parties, Families and individuals that are wanting something that creates 'Memories that last a Lifetime'. Read our Excellent reviews on Trip Advisor.